No matter how near or far you are, our family-owned and operated company is ready to go the distance for you. We offer 24/7 towing services, 365 days of the year. Our dedicated service includes heavy duty towing and roadside assistance. 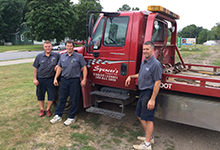 If you ever find yourself stuck, don't forget to call Spencer's Towing & Tire!